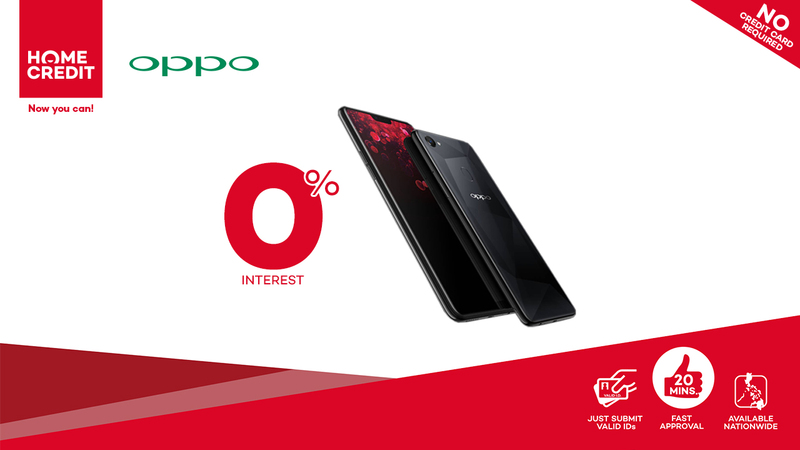 OPPO F7 is now available in 9 month installments, at 0% interest rate, thanks to Home Credit! OPPO Philippines just released their new AI-powered selfie phone OPPO F7, taking the center stage with its 25MP front-facing camera that’s designed to capture natural-looking selfies. Officially launched last April 8, 2018 by their endorsers Joshua Garcia and Julia Barretto, OPPO F7 is now available nationwide. OPPO never fails to bring out your natural look with its AI-powered selfie camera that stays true to your beauty, at the price of only Php17,990. Thanks to their partnership with global Fintech company Home Credit, you can avail F7 in 9-month installments at 0% interest rate – even without a credit card! Simply approach a Home Credit sales associate from any participating store, submit your filled-in form, present two (2) valid IDs, and wait a few minutes to get approved! OPPO F7 is like an upgraded version of the F5: faster, bigger display, longer battery life, and higher megapixels for your selfie needs! OPPO F7 is equipped with the highest 25-megapixel front camera. It has an improved A.I. Beauty Technology 2.0 that can target 296 facial recognition spots for a more precise personalized beauty. Now it can deliver a more unique type of beautification with its ability to customize up to four faces – whether male or female – for every person in the frame. With its real-time HDR Technology, it can take a superior range of luminance levels when shot in any lighting condition! OPPO F7 is designed with a Full HD+ resolution of 2280×1080 Super Full-Screen display on a 6.23” body, guaranteeing an enjoyable viewing experience. The notch screen area is maximized with a dedicated multitasking toggle to quickly send or reply to messages. Users can also take screenshots or record the gameplay for immediate sharing. OPPO F7 is 80% faster than its predecessor, with its octa-core processor and dedicated A.I. chips. Its 4GB RAM and 64GB storage make multitasking easier for heavy users. “If you’re into good photos, there’s always something for you in the OPPO F series. This is why customers enjoy their phones so much – they can be as creative as they want, get the complete smartphone experience, all within their budget – thanks to Home Credit financing,” said Home Credit Philippines Head of Sales Petr Korinek. At the price of Php17,990, you can get the next level of performance from OPPO F7. You can also try Home Credit’s 9-month installment at 0% interest rate! No need for a credit card if you have none. Simply approach a Home Credit sales associate from any participating store and submit your filled-in application form, together with your two (2) valid IDs. It only takes 20 minutes to get approved, and you’re going home with an OPPO F7! SMART Bro LTE Pocket Wifi now P1,995 only! Previous story UniKitty! debuts on Philippine TV to brighten your day!